Hola Lexicans! As you'll will know, we are finally getting a bit of sunshine and warmth and with only a few days until I break up for the summer holidays, I am definitely getting into the spirit of summer. 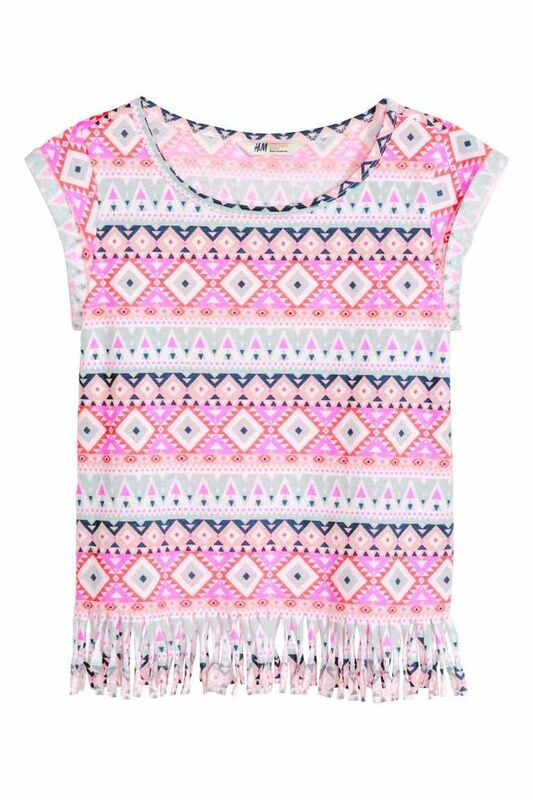 So, today's post will be a round-up of some of my favourite summery clothes for kids and teens. I think this dress is absolutely beautiful for an evening dress this summer. I think the blue is a gorgeous colour, and if you want to get even more summery, they do have it in a bright yellow colour too (personally yellow isn't my colour, hence why I included the blue version, but it's definitely even more summery). I also adore the lace addition to the top section; I think lace makes everything look good. Overall I love this dress! I absolutely love this top! I think the pattern is so funky (I actually have leggings with a very similar print which I really like) and the colours make it absolutely perfect for this summer. Also, the fringes at the bottom really remind me of summer too. Overall, I will definitely be making this an addition to my wardrobe for this summer. For £6.99 you can't go wrong! This is quite a simple top; but vests are absolute summer necessities, whether it be for lazy days around the house, barbecues in the garden, relaxing on the beach or going for a walk. I think the flamingo is so cute, and with a nice pair of shorts, this would be a really pretty outfit for summer days. These shorts are definitely on the pricier side compared to my other 3 items (if you added the price of the others together, it would be about the same as these shorts alone), however I think Topshop is known for having more expensive items. I absolutely love the bright colours on this and the print is so gorgeous and summery. Sizing wise, Topshop is always hard to work out, however as a slim and small 12 year old I would order a 4, and most of my 12 year old friends would order a 6 - you can take it from there (if you aren't sure what size you'd be, just comment and I'd be happy to work it out for you). Overall, gorgeous if you don't have much of a budget. So there are my top picks for clothes this summer! What is your favourite item there? Have you got any clothes that you think should be on there? I like all the pieces. 'cause I like to combination of the colors. Those are all so cute! I am in love with the third flamingo one! It is amazing! All these are awesome! Blue is my more preferable colour too! The first dress and the last shorts are my favorites! ^.^ They're vibrant with color, which s one of the things that I tend to look for in my clothing. I liked the shirt with the fringe! So cute and FUNKY!!!!!! !